Brief Description: Believing that the country is going to the dogs, particularly in relation to the misuse of the Queen’s English by the media, retired businessman Alan Corbett is not prepared to sit back and take it any more, and embarks on an obsessive one-man mission to save the English language – by fair means or foul. Drawing on his Territorial Army experience, Corbett focuses his increasingly sinister direct-action campaign on the twenty worst offenders. With very few clues and many erroneous deductions, Chief Superintendent Rayner and his team seem to be trying to find a needle in a haystack in tracking down their man. As the net gradually closes in, a nail-biting battle of wits ensues. How can Rayner outwit his wily opponent and obtain enough evidence for a conviction? And will all Corbett’s efforts to reverse the decline of the English language ultimately succeed? About the Author: Philip Sagar was born and educated in the UK and, after completing National Service in the Royal Marines, pursued a career in investment and banking, which took him to Dubai, Hong Kong, Japan and finally Switzerland. Since retiring, he has taken up writing plays (one of which was produced in London in 2003) and novels. A fine well thought out story; that has been well written. It would make a great film and TV production. I enjoyed this very much. A really good read, very interesting; plenty of erguments, problems and answers, Philip Sagar is an excellent writer! An interesting and engrossing read. Enjoyed Corbett's arguments and views, but he was hoisted by his own petard in the end! Cleverly, and well written. Well done Mr. Sagar! An extremely enjoyable and well-written novel with a message. It had to be written well - the core of the plot is the principal character's passionate pre-occupation with our rapidly falling grammatical standards. Mr Sagar skilfully builds anticipation that some hideously violent events will occur before the mystery is solved and the madman brought to justice. After finishing the book I find myself suddenly self-conscious of my speech, and considerably more careful with the written word! The message works. Let me make it clear from the outset. Like Asif is one of the most disturbing, chilling, brilliantly-written novel I have ever come across. My blood turned to ice as I turned page after nightmarish page. I think the author is a storyteller unparalleled in his genre and deserves much greater recognition. Okay; here’s the plot. There’s this man, and he’s sick and tired of seeing the English language abused. You know the sort of stuff; people who think that the final “s” in any word has to be prefixed with an apostrophe – Cornflake’s, potatoe’s, motor car’s…those who insist on writing “thankyou” instead of “thank you”, etc. Yes, they drive me nuts too. The difference is that Alan Corbett decides to do something about it. He wants to bomb them, in fact. With Biblical fervour and a sense of divine righteousness Corbett aims to punish those who have, in his opinion, themselves murdered the English language. A literal eye for a literary one, you might say. There are several things that make this novel truly disturbing. One is the absolute rationality of Corbett’s position. It is impossible not to sympathise with both him and his obsession, and every writer will be able to identify with his anger at the way the English language has, like, - there’s another example – been bastardised. This makes the character of the innocuously-named Alan Corbett seem very real; too real for comfort, in fact. The second thing that adds to the novel’s chill-factor is the way in which Corbett slowly, methodically and with impeccable reasoning goes about his cold, dastardly business. His very ordinariness makes him all the scarier, and hiding in the shadows is a dark idea: the scary thought that if I could step into the novel and talk to Alan Corbett - challenge him about his actions - he may actually be able to defend them quite articulately. In Corbett, Sagar has created a monster who leaves the reader feeling that he always has something else up his sleeve; that little “added extra” that will keep him one step ahead of Detective Rayner who is determined to track him down. By the time you’ve finished reading Like Asif you’ll start to wonder whether there could be an Alan Corbett living in every street – or, more to the point – inside each and every one of us. Like Asif is a work of stark brilliance, and I can’t wait to see the movie which it deserves to be turned into. I bow to the brilliance of Philip Sagar. The book makes for a great read. A riveting read with colourful characters set against a background of topical issues such as terrorism and the state of the English language. A BILLINGSHURST authour has published his first book about a business man who indulges in a campaign of terror to rid the UK of sloppy English. Philip Sagar has been successful where many others have failed and achieved a deal with Apex Publishers, based in Clacton-on-Sea. 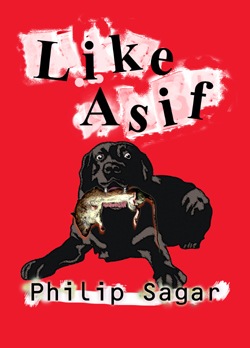 The novella “Like Asif” takes in areas around the Horsham district such as Five Oaks, Pulborough, Horsham and Rudgewick. Philip, 67, of Rose Hill, said: “It is about a guy who reckons the country is going to the dogs and is going to do something about it. “Our hero thinks he will concentrate on the English language – that is a big enough topic. “He says I am going to find the 20 worst offenders – these are people in the public eye. “They are obviously going to be media related – they are people that should know better. “He watches television and has five in his room. First thing he sends messages to them – no reaction. “The next thing with the aid of his faithful black Labrador Carstairs, he sends them something from the dog, again with the note asif. “By chance at that time the Prime Minister has offended. However as a result of the note “asif” Chief Superintendent Rayner, who is assigned to the case, meanders down the wrong path – in the direction of Islamic terrorist organisations. As the net draws in the reader is caught up in a cat and mouse game. Philip said: “I have been writing for profit – ha ha – for several years. “I wrote a couple of books back in the seventies which never got anywhere. “One of them was about some terrorists who got together and decided to blow up an army navy rugby match at Twickenham. “It was turned down by everybody because they said it was so unlikely. “It is a break in to publishing. It is a long hard struggle. Philip first moved to Billingshurst in 1969, then went on to live in Dubai, Honk Kong, Japan and finally Switzerland while pursuing a career in investment banking. Once he retired he took up writing and moved back to Billingshurst, where he has lived for several years. He has already had a play, ‘My Sainted Aunt,’ produced in Hampstead and directed by renowned Joe Hamston. Philip said: “I had thought of it three or four years ago as a short story. Then I did not do anything. “Then when Lynne Truss’s book [Eats, Shoots and Leaves] came out I thought well this is all quite topical and so sat down and wrote it. The English language is certainly a passion of Philip’s, but to what extent does “sloppy English” irritate him? “I actually worked for an American bank and I found it very annoying the way they turn nouns into verbs and spell colour without a ‘u’,” he said. “I am of a certain age. The book says our hero perfectly accepts that a language has to change in order to live. “There is nothing wrong with that. This is the excuse that they give for bad grammar. 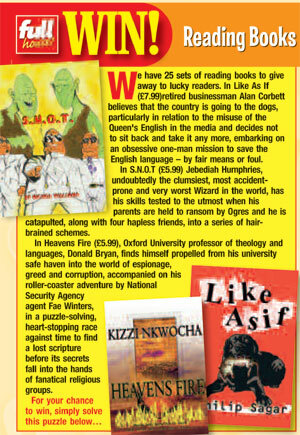 “Like Asif” can be ordered from Apex Publishers, Amazon or quoting the ISBN number in bookstores. I enjoyed it very much. I particularly enjoyed the last two chapters. I did not foresee the ending which was brilliant. Very clever. A 'ripping yarn' and great fun! Very well written and one really wants Corbett (and Carstairs!) to 'get away with it! '......whilst also empathising (and sympathising!) with Rayner (and Zoe!) A real page-turner and I couldn't put it down, though I have a demented life and normally only have time to read (for pleasure) on holiday! It's a perfect 'holiday read' and will be a great stocking-filler and Christmas present for all one's friends! BRAVO Philip Sagar! The idea is brilliant and I enjoyed every page! This is a super book! I have just finished my signed copy by the author, and, once I started to read it, simply couldn't put it down. It was LIKE a tremendous experience following the plot, almost ASIF I knew each of the characters personally. I especially loved the ending, and thoroughly enjoyed it from cover to cover. Bravo!